Have you heard of the Sew Bossy Initiative? Read about it here if you haven’t heard. You might remember the Sew Bossy exchange I did with Heather and Gillian. It was the pink polka dot top. Lizzy over at Sew Busy Lizzy sent me a Sew Bossy package and it arrived last week just in time for me to treat it like a birthday present! She’s awesome and a lovely bossy partner. 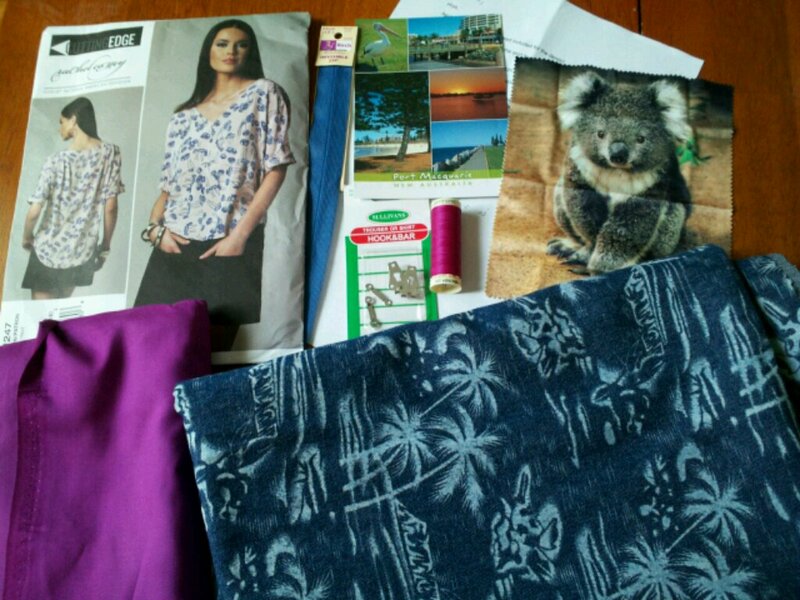 She sent me Vogue 1247 and this really cool printed denim and a magenta rayon that is just beautiful! The Koala is image you see is actually a wipe for my glasses. Lizzy also sent me a postcard with pictures of where she lives. I really just want to move there. Don’t we all? If you haven’t seen Lizzy’s outfit she made of this pattern, go check it out! While I do wear a lot of fitted stuff, I also like a relaxed fit and this outfit looks perfect for me. Thank you Lizzy for such a thoughtful package! I’m really excited to make this! Anyone else doing a Sew Bossy project? I have sent a Bossy project to Lizzy and I’m nervous whether she’ll like it or not. I’ll be over here biting my nails until it arrives. Oh and I have to say that those of you on Twitter who were tweeting at me on my birthday, you really made my day!! Thanks to MaLora Ann for making up the #Leiladay tag and making me smile. I mean, come on, I’m a middle child AND a Leo who has worked in theater… I loved the attention. I had one of the best birthdays in a long while. I spent it at the beach on Lake Michigan and hung out with my husband’s family in the sun by the water. It was glorious! So, thank you all again! Oh, man! Sew Bossy sounds spectacular!I just posted on the website that I want in! You could also post on twitter to see if anyone wants to swap with you. It’s so fun. Ooh! I love that denim. I’ve had that Vogue in my stash forever, and there’s a Carolyn(?) who has made several gorgeous versions of it, though I can’t think of her blog name off the top of my head. I can’t wait to see you make it up though, because as a fellow bewb-wrangler, it’ll be interesting to see what changes you make. Thanks for the link. I do like Carolyn’s blog and what pretty skirts she’s made. I’m thinking of pivoting that front bewb dart to an angle cos I will not do a dart like that. My poor bewbs would disown me. I’ll treat it like an experiment. Can’t wait to see your Sew Bossy make! I love this pattern so much! I can’t wait to see your take on it. Awesome fabrics there, way to go Lizzy. I still haven’t sewn that Vogue up even though I love it. Happy belated BD, and I’m looking forward to seeing your V1247 made up in that gorgeous denim… with magenta!!! woo hoo! Love those fabrics. I’m sure you’ll do something amazing. You always do.